This is one of the many novelty releases from Carlton Ware in their 'Walking Ware' series produced in the 1980s. This one is the 'Big Foot' in the form of an Tea Cup. 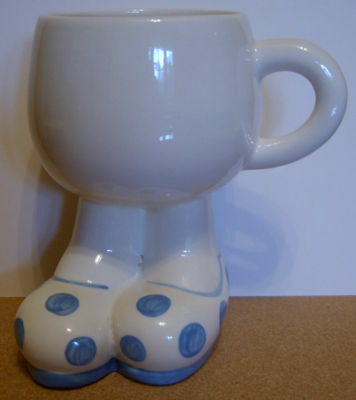 Designed by Roger Michell (Lustre Pottery) for Carlton Ware , this particular piece has the very collectable large blue-spotted shoes. The overall height of the Cup is just under 5 inches (12 cms). The Cup is in excellent condition. There is no evidence of crazing. It is backstamped under one foot.